I’m always “chuffed to bits” when readers contact me. Email, post-box, even a thumbs up on facebook–it’s all gravy. I write letters because I enjoy correspondence (and paper of course). But boy is it nice to know you dear readers are out there! Thanks for your email! I am so cheered to see some of my ‘originals’ coming back to the blog. Thank you for sticking with me, from the bottom of my heart. I started writing letters for me–I wanted to achieve something in 2011 so I set a goal. And while I fell short of a letter every day, I never expected the joy I would feel from sending letters to complete strangers. The people–the readers, the requesters and letter recipients–you all are the reason I count my would-be failure as a success. So thank you, for coming back post hiatus. 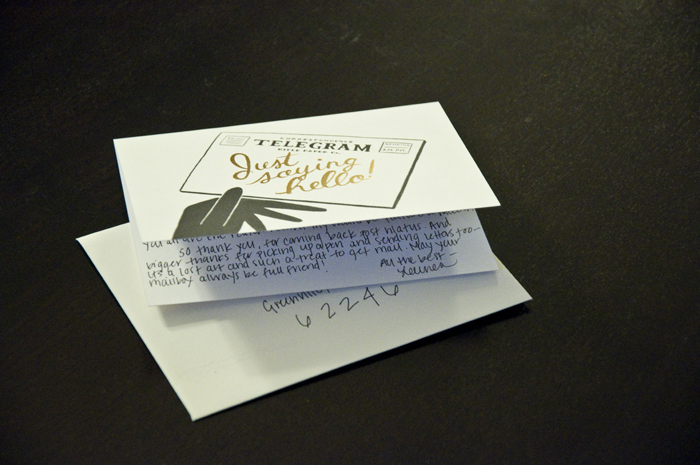 And bigger thanks for picking up a pen and sending letters too–its a lost art and such a treat to get mail. May your mailbox always be full friend! Yay! :) So happy to have received this!